From maintaining quality and capacity of highways and rail service, to providing mobility for persons with disabilities and safety for school children, planning is the key to assessing current and future needs. WCWRPC staff has a strong knowledge of all modes of transportation planning, rural and urban, as well as funding sources for all rural and urban transportation programs and modes to assist you in project implementation. Work efforts in the program include: assisting WisDOT on statewide priorities, such as corridor studies and updates to the statewide transportation plan, regional rail system analysis and advocacy; assistance to counties in specialized transportation planning and coordination; and general local assistance to rural communities and counties on a wide variety of transportation issues. Click here for the current Rural Work Program. 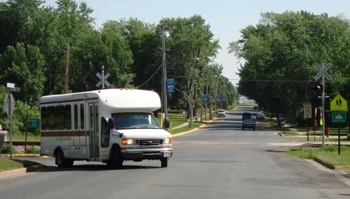 The purpose of the MPO is to carry out a continuing, cooperative, and comprehensive urban transportation planning process that results in plans and programs consistent with the planned development of the Eau Claire Urbanized Area and thereby satisfies the conditions necessary for the receipt of federal transportation funding for capital, operating, and planning assistance. Click here for current MPO business.